Tea Tree Gully batting all-rounder Mark Williams will play for St. Boswells in Division 1 of the East of Scotland League this season. Mark Williams (19) is a hard-hitting left-hand batsman and economical off-spinner who has played for Tea Tree Gully District Cricket Club in South Australia for the past 7 years. He has progressed through the grades, from Under-14s through to the Senior C Grade. In 2011, he was selected to play in the BankSA Shield team in an Under-17 State annual tournament as one of the younger players. During these years, he has also played for Trinity College Gawler in the Independent Schools Association and skippered the 1st XI from Year 8. He has toured with Trinity College to Darwin twice to complete in the Northern Territories Under -7 tournament and Ballarat Vic twice and have been involved in all inter-collegiate matches from 2010. In 2011, he won the Trinity College “Best Batsman” as well as runner-up for the “Best and Fairest” player. Due to compulsory college rules, Williams’ 1st X1 commitments took precedence over club cricket, therefore never played complete seasons with Tea Tree Gully club until he finished College in 2013. In 2012/13, he filled in for Trinity College Old Scholars playing 4 matches averaging 43.80 including a 102. Whilst he has been used as a part-time bowler for Tea Tree Gully, due to the number of spinners in the club, he was Trinity College’s front line spinner bowling off-spin. Williams is excited about heading to Scotland this summer and is hoping to make a big impact for St. Boswells in the East of Scotland League. We intend to keep him very busy, not only on the pitch, as an attacking player for our 1st XI, but also as a key member of our junior coaching setup, which is starting up again on Tuesday evenings from 6th May. 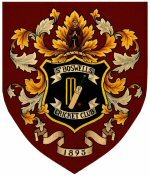 We are delighted to have Mark at St Boswells for the season and are sure he will make a great impact in all areas of the club – maybe helping us push for ESCA Championship status in 2015.